And, congrats to the Estancia High School Eagles for winning their playoff game Friday. Lots of hard work and skill plus some pretty good coaching paid off for those young men. In the spirit of Thanksgiving, I invite you, once again, to visit the blog o f my friend and former Daily Pilot photographer, Kent Treptow - http://kenttreptow.com/blog/ - which chronicles his amazing solo walk across the country - from Maine to southern California. If all goes well he should be dipping his toes in the Pacific Ocean sometime in the next few days. His adventure, which has covered the past 170 days, has been fascinating to follow. 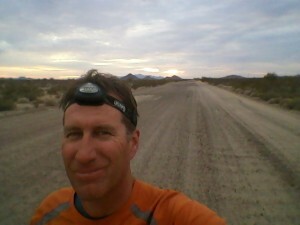 This photo, courtesy of his blog, shows him "on the road" not too far from home. That's all for this one. It's a slow week at City Hall next week, but I'm sure there will be news to cover. Stay tuned. With the exception of the players and the coaches, no individual has worked harder to build Estancia football that Steve Messinger. Putting politics aside, let’s give some credit where credit is due. If you're gonna shill, at least spell his name correctly. Unless your subconscious is trying to tell us something. The contributions and efforts of Steve Mensinger will benefit this community for years to come. His time, money & opportunity costs are significant. There is a tremendous source of pride. The buzz is exciting. Already talk of repatriation of students back to Estancia. Great stuff all around that will be on display this Friday for a home game at Jim Scott stadium. I would fall out of my stadium seat if I saw the likes of Geoff West at the game. I don't think he would understand or appreciate the event. For all the pictures he takes, the important picks will be taken of our future leaders on the field. Anyone who has played competitive team sports knows how this is about so much more than football. Go Estancia. Thank you Steve Mensinger , coaches and volunteers. Joe, you are invited too. Was it just me, or did the banners they hung up near the stadium acknowledging the Battle of the Bell and league championships say 2010? I'm just askin', not lookin' to stir up trouble. I'm a proud EHS alum and am thrilled to see them go further than they ever have in the playoffs. If you are going to thank Steve, then you had better thank Robin just as much, if not more. She puts in just as much time and effort as her husband. She may not always be visible, but what she does behind the scenes goes far beyond what is expected. And she does not do it for any glory, she does it strictly from her heart and for her boys! This is just got to stop.....you people have lost all perspective. The best thing about Estancia football is the players...Robert Murtha and Brad Wilson have a little to do with their success......Thats putting credit where credit is due.Something which I've not seen mentioned by the local sychophants. The politicization of our local high school football program is wrong. Bad politics, do not get erased because Eagles win games. Do I take credit because the girls water polo went to CIF for the first time last year, or the Estancia Drama got 2nd for the State in a SETA competition? No........because I didn't do it. The kids did. They have great programs, great teachers and a great principle......and we still have a BAD city council. The two have absolutely nothing to do with the other. After all of the rich foods I ate this T-Day I'm having a hard time swallowing this sugar coating for the MESIAHinger. Great coaching, hard work and dedicated players. NOT some 'over the hill' dad trying to get back slaps for what the kids and great coaching have done. Let the boys bask in THEIR victory more than a day before you give 'high 5's and knuckle (or chest) bumps' to a non-elected Politian. "You must excuse all the damage Menssy's done to the city because he's done so much for the HS football program." Imagine that. Greg Ridge, OC Longhair, Mike, Joe, et al, do not see the value and contribution brought by Mensiger. Goes to show these folks are blinded by anger and further demonstrates how far from reality they are, and how inconsistent their views are with the silent majority. Imagine that... in two separate posts attempting to heap praise on Steve Mensinger for his prodigious contributions to youth sports, two writers (or, most likely, the same one using two different names) misspelled Mensinger's name! I have NEVER failed to give him credit for his contributions to youth sports in this city. That DOES NOT make him a good councilman - one who holds his seat because THREE residents wanted him up there. Geoff, your anger clouds your judgement. Besides a keen eye for spelling your insights are warped. We know as well as you that if the decision of 3 Council members was to appoint someone you supported, you would be making the case that we as a city elected the 3 to make these decisions. Once again the reality is lost on you and your Jerry Springer crowd. Call the coaches. Call the parents. Let them tell you what they think on Mensinger as a Booster and a Councilman. Ask them how they like their new streets. Ask them if they will take a Sign. Answers will bind you to reality. I don't hate, I just would like to see the TEAM get the kudos not the boosters. On my street there are 6 USC flags flying proud every Saturday during football season. I guess I should run up to each door and 'High 5, Chest Bump' them for doing such a great job on their UCLA rout. Eric... grow a pair and fess-up to your lie! "Geoff, your anger clouds your judgement." Helping HS football does not and will NEVER excuse gutting our police force and other offenses against the citizens of Costa Mesa. "On my street there are 6 USC flags flying proud every Saturday during football season. I guess I should run up to each door and 'High 5, Chest Bump' them for doing such a great job on their UCLA rout." Don't you know STEVE went to USC?! Give credit where credit is DUE Mr. Longhair!If the MESSIAH hadn't attended USC they never would have developed the POWER to beat UCLA! Boy I guess the re-elect Mensinger campaign is in full swing. It is amazing that a heartfelt congratulations to the Estancia Football Team becomes a lovefest for Mensinger and then his wife. How creepy is that? What about the players and the coaches that made it happen? At least the newspapers know where the proper credit is due. "Leader of the Band is West" also got Mensinger's name wrong, which makes me believe the same warped person is continually posting. If Steve is the man and father I hope he is, he would definitely want the credit to go to the team and the coaches and not to him. Really, you think it would be an effective use of time to troll for votes here? Really? Talk about people who have a higher opinion of themselves than warranted. Pretty sure any real candidate has discounted the handful of votes offered here. This is a very few of the vocal minority. I bet Steve does deflect the credit to the kids & coaches. However, that does not mean he deserves a big thank you and heaping of credit for his involvement. I too think anger clouds the Pot Belly’s judgment. Many of you will know the picture referenced where Geoff West got a little of his own medicine when another blogger put up pictures of West and compared his pot bellied picture to a cross between Captain Kangaroo and a Pot Belly Pig. Now that was cleaver and humorous. Gee, I guess we can’t put politics aside. As someone pointed out, given the misspelling, if I’m a shill I’m not a very good one. In fact, I’m a neighbor who doesn’t agree with everything this Council is proposing to do but see the positive contributions to the community made by folks like Steve and Robin. Geoff, you’re a fine writer with a passion for the city, but you do yourself a disservice when you assume that everyone who says anything positive about the actions of the council is a shill. Steve Mensinger is great for creating the future Al Bundys of the world. With around 1700 NFL players any given year in a country with a population of 307 million people, it's delusional to think most of Costa Mesa's young men will be able to make a living throwing a football around and patting each other on the heiny. Sure, it's fun. That's how it should. However, focus on something that they can really use, like an education for both our young men and women. Focus on something they can actually use and that benefits society. David B., if you'll pay just a little bit more attention to the comments here you'll realize that I DID NOT refer to anyone commenting here as a shill for Mensinger - even though that may actually be the case. If you're going to throw stones, at least pick the right target, for goodness sake. "David B., if you'll pay just a little bit more attention to the comments here you'll realize that I DID NOT refer to anyone commenting here as a shill for Mensinger - even though that may actually be the case. If you're going to throw stones, at least pick the right target, for goodness sake." That was me who said he's a shill. David, let's NOT put politics aside when our police force has been drastically cut and the city faces many other problems because of Mensinger and his cronies. In once sentence you castigate (wrongly) Geoff for calling you a shill when poor little innocent you, a neighborhood friend no less, just wanted everyone to know how nice Steve does with football. "..but you do yourself a disservice when you assume that everyone who says anything positive about the actions of the council is a shill." Oooh, big leap from "Steve is good for football" to "actions of the council." So it was really about the "actions of the council" not Steve and football all along, wasn't it Dave? Thought so. Have a nice day. David B....How did this heartfelt comment "And, congrats to the Estancia High School Eagles for winning their playoff game Friday. Lots of hard work and skill plus some pretty good coaching paid off for those young men." cause you to swoon for Steve Mensinger? You are the one who made it political and then you whine about it. Oh and it was Joe who called you a shill, not Geoff. Try and keep the names straight OK? Is Estancia Football part of "actions of the council" now? Come on Righeimer- get yourself some better comedy writers. I'll save my alleged anger and hatred for a topic that merits it. I guess I didn't notice it in the two innocuous comments I left on this post, Leader... but since nobody has answered my question, I guess I'll have to do a drive-by to see if my eyes deceived me regarding the banner dates. How about those banners? Crazy, hmm? I'm stoked because my sons played Eagles Football. Go Eagles! So I’ll practice charitable thoughts here and muse on the banner mis-statements...maybe they feel the financial pinch, so they're just recycling and reusing? Maybe they thought we wouldn’t really pay attention? Or if we did notice and they got their spin doctors to tell us it really means something different than what it actually says, we'd believe them and say "Gee, we must have misunderstood, thanks for the transparency?" Arrgh! I can’t seem to leave politics out of it! Sorry, Brian B. At least you got in the game. Don’t be discouraged; blogging is a contact sport for some. This is a lively blog, and we have a host who tolerantly posts a wide variety of viewpoints, not just the ones he agrees with. Don’t know if you followed the Nov 22 “A Reason To Give Thanks” post, there have been 42 comments on it so far. About half of them are from the same shill using different aliases, but that’s still a lot of response for a comment thread. The Daily Pilot would love so much interaction! It’s fun, it’s informative, it’s thought-provoking and entertaining. Sometimes I feel like it is life or death serious as far as the health of our City is concerned. I know it is. If we don’t watch and act, we stand to lose much of what we value about our unique little City. Last I heard Mensinger said "It doesn't matter what is printed on the banner, I will tell everyone that it says 2011 and because I said so, it is true." Then he flashed his toy sheriff badge and tried to arrest the 700 students who questioned him. He chest-bumped 400 more, then called the District and filed a complaint against Teacher Flores, who wasn't even around. Luckily, Righeimer arrived at that very moment, his chair carried by Colon and Fitzpatrick. Little Steve fell to his knees, as always. Some of these posts are just bizarre. Saying a booster member and his wife are equally responsible for Estancia winning the playoffs as the actual players and coaches is just so wrong on so many levels. The fact the he is a politician makes it even worse. Let the kids and coaches bask in their own glory. David B, you should be ashamed of yourself.